Enter Contact Information to be used to complete the purchase. Enter the daytime telephone number where you can be reached in case there is any question while processing your order. Enter an Email Address in case there is any question processing your order. This is optional unless you check Please notify me of new products and product updates below. If you wish to be able to check the status of your order online, you must enter an email address. Enter a password to be used when you want to check the status of your order online. Please notify me of new products and product updates. 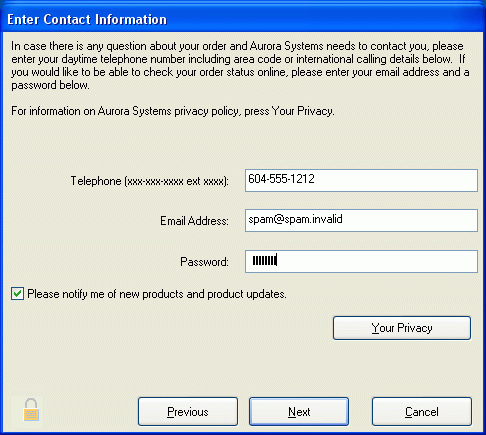 If you have entered an Email Address above and you wish to be notified when product updates or new products from Aurora Systems become available, check this box. Press this button to confirm your entries and move to the next step. You must enter a telephone number before you will be able to proceed.